Writing a Wikipedia entry about yourself is pretty feeble, but having your PR department do it for you is even worse, especially when they choose to skate over some of the rockier patches of your tenure as a museum director. According to the New Zealand Herald, Russell Briggs, head of public relations for the Auckland Museum, produced an air-brushed profile of the Museum's director, Dr. Vanda Vitali, which omitted some of the more interesting events of her tenure including lay-offs, rejecting a proposal for a war memorial, and having a public spat with the children of NZ climbing god Sir Edmond Hillary. Wikipedia itself notes that it "is not a soapbox, an advertising platform, a vanity press.... Self-promotion, paid material, autobiography, and product placement are not valid routes to an encyclopedia article." All this seems like a bit of a storm in a teacup to me. People that write articles like this seem to miss the point about Wikipedia, which is that anyone can edit the articles to correct it or put in missing information. For example, this entry, which seems a little on the short side, is particularly ripe for editing. Last week on the VP Listserve, much ire was expended on the subject of the journal Nature and its editorial practices. Kicking off the complaints was a Brazilian scientist, Mario Cozzuol, who had just submitted a MS to Nature in which he and his coworkers had described a new species of tapir, the first new species of extant perissodactyl to be described for over a Century. Cozzuol reported that he had submitted the paper at 8:30pm local time. By 8:30am the next morning, a rejection from the journal was waiting for him in his email in-box, which is a pretty impressive turnaround. At least he can't claim they kept him waiting. "Another long-standing myth is that we allow one negative referee to determine the rejection of a paper. On the contrary, there were several occasions last year when all the referees were underwhelmed by a paper, yet we published it on the basis of our own estimation of its worth." Sometimes that works well (e.g. Watson & Crick's 1953 paper on the structure of DNA, which Nature published without peer review) and other times it doesn't (Jacques Benveniste's 1987 paper "proving" homeopathy). The error that people make when they get all aerated about Nature's seemingly high-handed policies is mistaking it for a scientific journal. Truthfully, it isn't one, or not as most scientists would understand the term. It's a news magazine for a scientific audience. It forms part of a PR continuum for research that runs from Nature at one end to a brief paragraph in the local paper at the other. In my own field, for example, Nature is used for the initial announcement of important fossil discoveries, but the publication that has the longer shelf life is invariably the monographic description of the specimen. This usually arrives some months or years later after careful study has been completed. It is comprehensive, detailed, has benefitted from proper peer review, and is often repeatedly referred to and cited for decades afterwards. By contrast, a "Letter to Nature" is the scientific equivalent of yesterday's papers - on the bottom of the budgie cage by the next day. What struck me as I read Cozzuol's impassioned defense of the rigor of his group's work on the new tapir, encompassing morphology, paleontology, 3 sets of mitochondrial genes, statistics, cladistics, etc., was that here was a study that was wasted on Nature. It needs to be published in some heavyweight scientific journal, where they can lay out their evidence in full, have it read by an informed audience, and (if it stands the test of time) added to the canon of literature on mammalian evolution. Then (as Cozzuol himself rather tartly pointed out) someone else will get to publish a comments article about it in Nature and help themselves to the impressive citation impact factor. You won’t have heard of me, but I write a small blog called Prerogative of Harlots. It concentrates on the museum world and has a modest, but loyal readership. I mention this in part because I’m posting this letter on the blog and I would be delighted to also post any response that the BBC would care to make. One of the things that I spend a lot of time talking about is on-line access to information; museum collections, archives and other resources. So I was very interested to read an interview in last week’s Independent with Roly Keating about the BBC Archives and progress towards releasing some of the Corporation's enormous holdings of film and video on-line. Unfortunately, due to rights restrictions out of our control, the programmes in the BBC Archive Project collections are only viewable from within the UK. We do appreciate that there is a wider audience for this, and that this might be frustrating for non-UK visitors to the site. It's simply that it often costs more money to make programmes available worldwide, which would reduce the amount of programmes we can provide for free. Additionally, as the programmes were funded by UK licence fee payers, our first responsibility is to the UK audience. You should, however, be able to view the documents in our various collections. Hang on a mo. I can understand that these days, when you contract out much of your program making, getting the rights to broadcast overseas may be a bit tricky. But is the BBC seriously trying to argue that it doesn’t own the rights to the material in its own archives? Speaking as a museum professional, who has to deal on a regular basis with rights issues, that position seems bizarre. The second part of this answer is even more confusing. It says that the BBC appreciates that there is a wider audience for this content. That is something of an understatement. By the BBC’s own estimates (2006), there are 5.5 million Britons living and working outside the UK. That’s almost 10 per cent of the population. And it doesn’t begin to take into account the enormous Anglophone audience of the Commonwealth and USA. Apparently, it costs more money to make this material available to users overseas, which would reduce the amount of material you can make available for free. This begs the obvious question of why you don’t simply offer overseas visitors to the site the opportunity to purchase a subscription to view content. I, and many other expat Britons, would willingly pay a fee in return for this ability. You do not need a television licence to watch programmes on the BBC Archive site. Please note that the BBC iPlayer is not the same as the BBC Archive player, and you do need to be covered by a TV licence if you wish to watch 'live' (simulcast) TV programmes via iPlayer. BBC America’s bargain basement content devalues the BBC brand. The BBC is one of the finest makers of television in the world, but you wouldn’t know it from watching their overseas TV content. You could address this problem by providing a premium internet subscription service. As it is, your digital content is hemorrhaging into cyberspace as people steal it. The demand is there, but because there is no legitimate way of accessing programs, overseas viewers use proxy servers to bypass the block on non-UK IP addresses; they download programming via Bit Torrent; and they post content on YouTube (incidentally, this has introduced a whole generation of Americans to “The Thick of It,” one of the finest comedies the BBC has ever made, and one that to the best of my knowledge has never been shown on TV here). So why is a museum guy complaining about the BBC? Well, you did open the door by having Roly Keating boast about an amazing on-line film archive that it turns out no-one outside the UK can access. I would be equally critical of any museum that was as half-hearted in the way that it made resources available. The BBC website has the finest radio services available on-line. Why? Because you make them freely available, without restriction. Why can’t you do the same with video content? Yes, there are challenges. But the BBC is supposed to be a global media organization. If the BBC can’t solve these challenges, what hope is there for the rest of us? The release of archives on-line from the National Gallery in London has attracted much interest from the media (for example, see here) but only the intrepid PoH would give you a link to the actual document, which is a hoot. 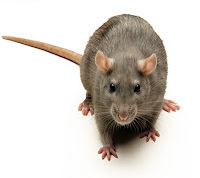 A list of rats killed by Gallery staff during the years 1940-1943 provides not only the number and location, but also the method of dispatch, which includes "drowned by Pitkin," "Calvert's boot," "Calvert - stick and boot" (Calvert, obviously a dedicated rat catcher, turns up several times in the document), and, most graphically, "speared by Pittock with poker after it had escaped, with great excitement." Was the excitement caused by the escape of the rat, or was Pittock stabbing excitedly at the rat with his poker? The documents do not tell. But honestly, what sort of a man impales a rat on a poker rather than just knocking it on the head? Lately I've become aware that PoH is turning into an endless parade of doom and despondency. Honestly, it's not intentional, but it seems that good news is in short supply at the moment. But when I do hear good news, I try to pass it on. Anyway, here is some good news. 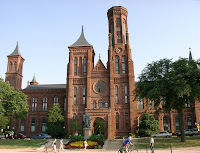 NSCA reports that the President has requested a $36 million budget increase for the Smithsonian Institution (SI) in fiscal year (FY) 2011). If approved (OK, OK, so it's not entirely good news), SI would operate with approximately $797.6 million of federal funds. Within this amount, roughly $661 million (an increase of $27 million) would be allocated to Salaries and Expenses with the balance of $136.8 million allocated to the Facilities Capital budget. The Salary and Expenses budget line reflects Smithsonian’s new strategic plan and allocates funds in four major categories: $8 million for Biodiversity (including support for biodiversity and climate change research), DNA barcoding, and the Encyclopedia of Life Web site; $1 million for Understanding the American Experience; $500,000 for Unlocking the Mysteries of the Universe; and $500,000 for World Cultures. The budget request also proposes to invest an additional “$2.4 million to improve the preservation, storage, documentation and accessibility to the Institution’s collections (yay!) and for the care of the animals at the National Zoo. The term ‘broadening access’ in the strategic plan refers to making the collections accessible to researchers and people who cannot visit the museums by using the Internet and other technologies. A total of $1.5 million will be dedicated to staff and computer equipment to continue the process of digitizing the Smithsonian collections. As you'll know from previous posts, this is something PoH is greatly in favor of. Funding for collections would grow to $73 million, up from roughly $69 million for FY 2010 and the $64 million appropriated for FY 2009. The President has also requested important new funding for SI research. If the requested $86 million is appropriated, the federal investment in SI research would be roughly $15 million higher than the FY 2009 appropriation and nearly $12 million above the estimated funding for FY 2010. The President’s budget also includes funding to provide for an increase of nearly 70 civilian full time equivalent (FTE) positions across SI. So they'll be job opportunities as well. Will the cuts ever stop? I started out this blog back at the beginning of last year bemoaning the effects of the economy on museum programs and it seems like the troubles never end. This week my own institution, Yale, announced a second round of measures aimed at reducing the University's annual expenditure by another $150 million dollars. This will undoubtably impact Yale's museums, just as it will affect programs across the University. In the museum collections world, the main buzz surrounds the demise of the Save America's Treasures and Preserve America grant programs, which the Obama Administration has announced will no longer be funded in FY 2011. These are not huge programs - cutting them will save $30 million per year from a Federal budget of $3.83 trillion - but they have had a big impact. Save America's Treasures is an important source of funding for conservation projects and it has supported an impressive roster of work over the last 11 years - from conserving the original Star-Spangled Banner to supporting work at the Henry Whitfield House in my own home town of Guilford CT. Search their list of projects and if you live in America I guarantee you will find a SAT supported site within an hours' drive of your home. Of course, the easy solution is to shrug your shoulders and say that everyone is suffering at the moment. But as my friend and colleague, conservator Sari Uricheck wrote last week "the signal that conservation and preservation efforts are expendable during tough economic times is worrisome... it is hard to accept such an extreme cut that indicates little value is placed on the preservation of the fabric of our history, creativity, and culture." Of course, the world won't come to an end because the Save America's Tresures Program gets cancelled, and that's part of the problem. Museum workloads have slowly been creeping upwards, while staffing numbers have been sliding downwards. It's a stealthy process - new staff *do* get appointed, but my experience is that few of these are new positions and that usually the "cost" of one new appointment is two or more frozen or eliminated positions. Because this a slow process, the damage isn't always easy to see. Collections staff can still do the loans, enquiries, and visitor support that are the visible component of their job. Where they struggle is with the long-term, unglamorous, and largely invisible aspects of museum work - cataloging, conserving, rehousing, and recurating. We now have a slew of reports (which I've discussed elsewhere) that document the effects of years of trimming - the nation's heritage in a parlous state. There's a school of thought that sees a silver lining in the current economic cloud; that by implementing austerity measures we clear away inefficiency and "dead wood" and come out with something better. The various reports on the state of the nation's collections prove that this just isn't true. We haven't ended up with leaner and more efficient institutions - instead, we have institutions that can no longer do their job. Ultimately the economy will turn around, but the damage that we've caused so far will be a lot harder to reverse. My mother always said "never trust anything that lacks hard parts." Actually that's a lie - she never said anything of the sort. But she undoubtably would have if she'd read a paper in last week's Nature by Robert Sanson, Sarah Gabbott, and Mark Purnell of the University of Leicester. The title, "Non-random decay of chordate characters causes bias in fossil interpretation" is unlikely to sell many copies of The Sun, but it's the sort of thing that makes paleontologist's hair stand on end. Generally speaking, paleontologists depend on the organisms they study having biomineralized elements (bones, shells, exoskeletons, etc.) 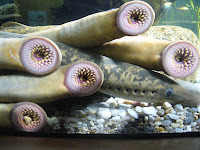 which are preserved through fossilization. Things without hard parts tend not to fossilize, which is unfortunate because these are often the animals that you want to look at most - for example, our distant vertebrate ancestors back in the Cambrian. In some rare instances, however, the circumstances of the animals' death can leave unmineralized soft parts preserved as organic films that record details of their anatomy. The discovery of fossils of this sort from deposits like the Burgess Shale in Canada and the Miaotianshan Shales of China has revolutionized our understanding of the early diversification of the major groups of animals. As with all fossils, preservation is never perfect; bits tend to decay before preservation can take place, so there are always some characters that are missing. But up til now, paleontologists had always assumed that this process was more or less random; in other words, if a feature was missing in one fossil there was a reasonable chance that it would be preserved in another one. Given enough fossils, you would be able to get a fairly complete picture of the animal's anatomy. This turns out not to be true. Sanson and his coworkers took specimens of a couple of living analogues for early chordates that will be familiar to anyone who's done a proper biology degree (i.e. one where you actually look at some multi-cellular organisms as well as mucking around with gels and test tubes) - the lancelet (aka amphioxus) and the ammocoete larvae of lampreys - and allowed dead individuals of both to decay under controlled conditions. What they discovered was that decay is not random; bizarrely, the characters that are most useful for determining the evolutionary relationships of these organisms are the ones that tend to decay first and are thus less likely to be preserved. The end result of this is that the fossil may give you the impression that the animal is more primitive than it actually is. Sanson et al postulate that a lot of the "basal" taxa in phylogentic trees like that of the vertebrates may be nothing of the sort; they are actually more advanced organisms that have undergone "stem-wards slippage," sliding down towards the base of the tree in phylogenetic analyses because of missing data. And that slippage is caused by the differential process of decay. If I worked on fossil invertebrates, I'd be feeling pretty sick by now. But as I work on mammals, which have an abundance of hard bits, I'm off for a hearty lunch.